Come along to the Aquarium to go on an egg-citing adventure! 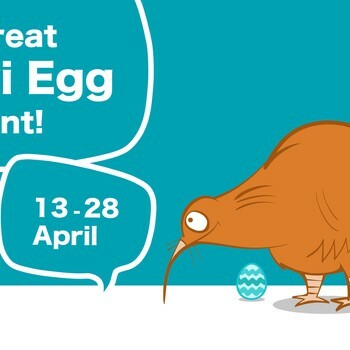 Not just any egg hunt, it's an egg-streme search for 11 great Kiwi eggs amongst our exhibits! If you can crack the answer by spotting all the Kiwi eggs, you'll go into the draw for a 12 month Friend of Aquarium Family membership! You'll also become an eggs-pert about our wonderful New Zealand icon, the Kiwi, by learning some fun facts along the way. Each general admission ticket will give you a special Kiwi Egg Hunting sheet with clues and a free Aquarium pencil to get those answers right! Start hunting from Saturday 13 April until Sunday 28 April. Any admission ticket purchased between 13 and 28 April 2019 gives you a hunter sheet to complete and enter the draw. Existing Friends of Aquarium members can also receive a hunter sheet when arriving. Entries must be on an official hunter sheet issued when you purchase your admission ticket. Photocopies not accepted. Correct entries will be put in the random draw for the prize of a 12 month Friends of Aquarium Family Membership (2 adult & 2 children). Membership start date will be made upon collection. The above prize cannot be exchanged. The winner will be contacted by phone or by email and advised before 12 May 2019. The Great Kiwi Egg Hunt! Come along to the Aquarium to go on an egg-citing adventure!